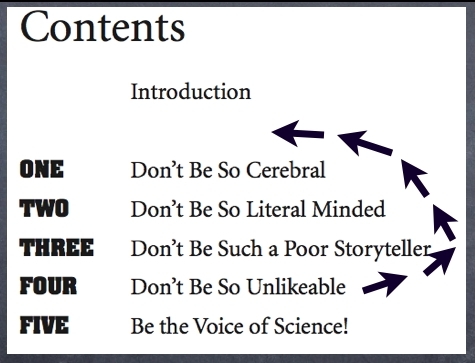 I’ve come to realize the logical flow of the four core chapters of my book, “Don’t Be Such a Scientist,” actually work best in reverse order. 4, 3, 2, 1, BLAST OFF! If you’re as lousy of a golfer as I am then you’re familiar with the age old tradition that allows you to hit your first drive into the woods, shout, “Mulligan!” to your partners, then start things over again. I’m beginning to think I’d like the same thing with the order of chapters in my book. As I’ve given lots of talks on it, I’ve come to realize that the best way to put the contents of the book to work is to actually start with the last of the 4 core chapters first then work backwards. The fourth chapter is about likeability and unlikeability — or more specifically about finding the right common ground/messenger with your audience. I didn’t write this in the book, but what I say these days is, “It’s as simple as this — people listen to voices they like, they don’t listen to voices they don’t like.” Just like music. You can write beautiful lyrics, but if you pick a horrible singer to perform it, no one will ever even get to the content of your lyrics. As Malcolm Gladwell made clear in his brilliant book, “Blink”, it all happens very, very quickly. People hate the voice and disconnect in just a few seconds. And everything is over with. How do you create a likeable voice? That leads to the third chapter which is about storytelling. More than 85% of the world’s population get their daily values and norms from the stories they learn from their religions. It’s still the most powerful means of mass communication. People love stories, so tell a good story (with the right voice) and they will listen. How do you tell a good story? You need to be less literal minded, which is the contents of the second chapter. And how do you become less literal minded? You have to come down out of your head to use emotion and humor. Which is the contents of the first chapter. All of which is a more practical and useful flow of the information than the way in which is it laid out. So if you plan to use the book in a class or workshop, I strongly recommend you give thought to this. And by the way, all of this falls under the subject of “story development” — as in developing the story of the book. I had about 30 years of incubation behind the writing of the book, going all the way back to 1974 when I first started working with scientists as a college dropout and marveling at the way they talk and think. And yet, clearly that still wasn’t enough time to get the story exactly right. I don’t have any regrets on anything in the book, but if I were to write it again today I’d put those four core chapters in this reverse order. It just has taken me a couple of years of speaking to realize this. Bottom Line: It takes A LOT of time to tell a good story with the most logical sequence of events. I’ve just figured this one out, two years after publication.